The above are some of the items I've found that I think would make great gifts for a whole range of people in your life. The bespoke heart map prints are such a cute idea - have them personalised to indicate where you first met, got married or were born... the list is endless. 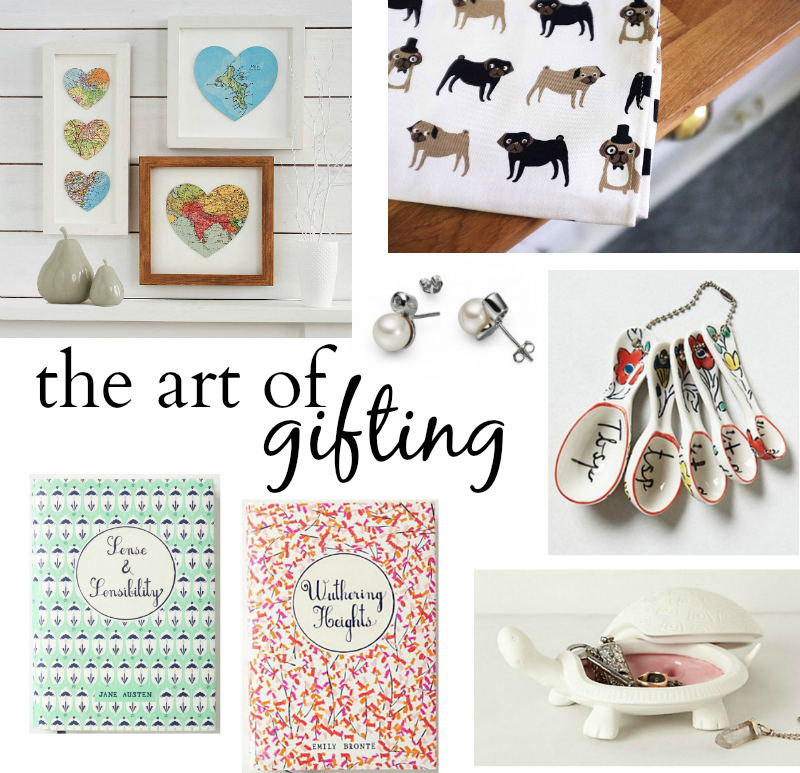 Not On The Highstreet is one of my favourites for unique gifts that help you find something really perfect - the pug print tea towel would make the perfect gift for any crazy dog lady such as myself or gent! Anthropologie is the home of un-essential but super gift-worthy items such as these measuring spoons and this trinket dish. Keep your eyes peeled for another post in the near feature on this topic! I can think of so many people these Mr Boddington's Penguin Classics would be perfect for - not only are they classic reads, but their limited-edition style covers are so gorgeous and would make a welcome addition to anyone's bookshelf or coffee table. Again, probably not something you could justify buying yourself, but an excellent gift. And finally - real, proper jewellery. I am most definitely guilty of this one; I always wait for people to buy me jewellery as gifts. Be it a statement necklace, simple rings to fuel my layering obsession, or proper pearl earrings like these from Mesenso. Classic and timeless, the perfect gift as you know these will never feel dated. I think I've got all bases covered here - for women at least. Now to have a think about gifting for men... possibly the hardest task known to woman-kind? !